It’s the stuff truly happy stories are made of; A family opens a restaurant around one brother’s love of culinary arts and the other’s passion for vintage style and video games. Everyone eats pizza and they all live happily ever after. 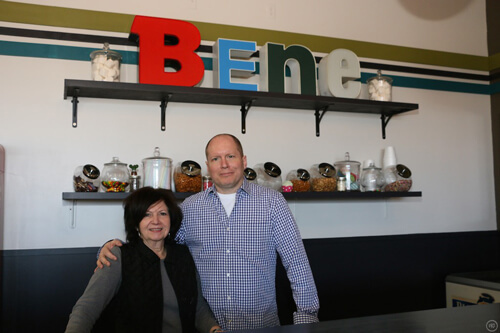 It sounds like a fool proof formula, yet the owners of Be’ne Pizza and Pasta on West Maple road were calling on Robert Irvine and the cast of Restaurant Impossible for help in late 2014. After 11 successful years in business, brothers Jon and Bobby Lanphier found the restaurant they co-owned with their mother Ginger suddenly struggling about 2 years ago. Bobby was in ill-health, Jon had to move back in with his parents, and Ginger and Bob Senior’s retirement fund was being fed into the failing business. The seemingly volatile relationship between the brothers kept them working opposite shifts to avoid having to see one another, and the lack of communication caused further chaos. As the animosity grew, the men did what they could from opposite corners to sabotage one another’s day. In what should be filed under the requisite heartwarming part of the story, Bobby is struck with kidney disease. Dialysis left him too weak and tired to play an active role in his own life, let alone in the business. In a made for TV twist, Jon’s wife Kelly steps in and donates a kidney. Kelly’s selfless act should have helped heal some of the bad blood between the brothers, but instead of gratitude, Bobby takes to teasingly referring to his sister in law as “Big Kel” (not that it matters, but she isn’t) and belittling her intellect. I don’t know Kelly or her IQ, but maybe he only questioned her intelligence because she was willing to donate a vital organ to someone who repeatedly sends her home in tears. You know that nobody has a “spare” kidney, right? They come in pairs for a reason. Or perhaps “Big Kel” is a reference to how she’s just a much bigger person than I would have been in a similar scenario. Robert Irvine, the formidable host of Restaurant Impossible, is instantly put off by the cafeteria feel of the restaurant, the noise pollution of the arcade, and the portion sizes being offered. He watches a woman fill two to-go boxes with her leftover lasagna, essentially walking away with three meals for the price of one. Robert calls out Jon for the cost and is informed that the lasagna is mostly filler. He is further turned off by the frozen appetizer, but the restaurant isn’t struggling because of the frostbitten mushrooms. For more than a decade people have enjoyed the food at Be’ne, and so he continues to dig into the cause. He thinks out loud about whether the noisy arcade is actually benefiting the restaurant and is met with anger and ultimatums from the family, who suddenly seem to forget that they invited him there because they needed his help. A pattern begins to emerge. Designer Tanya is the bubbly counterpart to Robert’s eye-rolling seriousness, and the spoonful of sugar that helps the medicine go down. She brought with her a few bold colors, some slightly more sophisticated furniture, and a better eye for the use of space. She fills the dining area with a fresh feel, while maintaining the retro, family-friendly vibe the owners intended the place to have all along. I asked several people about their impressions of the food before the episode was filmed and didn’t hear a single criticism. I questioned these same people after the reopening and was told that the food tasted fresher, brighter, and that even with the smaller portions, they didn’t leave hungry. Robert tweaked a few of Jon’s recipes and gave him a few tips to help create satisfying meals without using “filler” to stretch the budget. The new recipe for stuffed mushrooms included fresh mushrooms and sausage instead of their standard frozen pre-stuffed appetizer. The chicken parmesan benefited from the addition of broccolini to brighten and bulk up the dish. The changes were welcome and the clients seem to enjoy them, but again, food was never the issue. I spoke with loyal Be’ne diner Amy Churchill about her experiences at the restaurant. She told me that while the environment was new, she was grateful that the pizza remained essentially unchanged. “They still had that same great customer service. I suppose that is following their motto: Peace, love, and family. The atmosphere was very unexpected. Very retro-contemporary.” So we hear again that the food was never the issue. A quick Google search of the restaurant shows that peppered among the loyal customer raves are several mentions of the brothers’ tempers. Online complaints are often followed by an offer to make things right, and the staff generally seem to want people to enjoy their experience at the restaurant. It is becoming more clear that the animosity between the guys is affecting people’s opinion of the establishment and Robert does his best impression of an amateur family therapist in the time allotted by the sponsors. The brothers promise to try a little harder to communicate and to create a more positive working relationship. To drive home his point, Robert decides to give Bobby a taste of his own ‘teasing’ medicine. The family is on pins and needles waiting to see if the beloved games are still in place after the remodel when Robert stages a truck to pretend to pick up the machines. Bobby verbally lays out the innocent driver, sending him on his way with some choice words, some of which are not as family friendly as the restaurant wants to be. “How does it feel?” Robert asks, hoping to have scared a little of the clown out of Bobby. Rest assured Pinball Fans! The games remain-not because they make the Lanphiers money, but because the Lanphiers want you to come eat, play, and feel at home. After several calls to speak with the owners were unsuccessful (due to how incredibly busy they have been) I finally nailed Jon down for a few seconds to ask if he feels the family was well represented in the episode and if they were happy with the changes. “It was a great experience” he tells me over the bustle of the crowd around 1:30 pm. “Everyone at Food Network was great! We kept the menu mostly the same, but use more fresh ingredients now” His attention is grabbed by a hungry customer, which seeems a fitting answer to the question: How’s business?